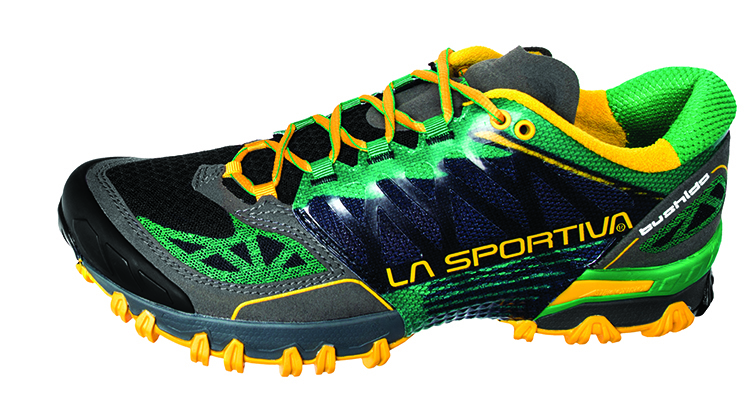 Bushido from La Sportiva is one of the Best trail Running Shoes in Spring Gear Guide 2015! The La Sportiva Bushido is a solid general purpose trail shoe that should appeal to performance-oriented mountain runners. It feels most at home on technical terrain and hills—think canyon crossings with twisty descents and steep rocky climbs, loose off-trail sections, and long ascents that involve a mix of running and power hiking. That’s where its stiffness is a real asset; on mellower paths it feels like overkill. Mind the fit: It runs half a size small. With performance driven design, the Bushido is perfect for technical terrain and provides added stability over stones, roots and branches on the trail. The “STB Control” construction utilizes a TPU frame that wraps under foot to provide maximum stability, responsiveness, and reduce overall weight. • Internal slip-on construction fits the foot like a sock without causing excessive pressure. • Outsole lugs have rounded edges and wrap over the midsole to provide added traction and enhance stability on off camber terrain.